Just 3 km from the important M & M outlets of D & G, Gucci, Armani, Diesel etc. kitchen / living room, bathroom with shower. APARTMENT GIRASOLE 110 square meters. 2 rooms with 2 + 1 beds each +. FREE WIFII. kitchen, living room, bathroom with shower. 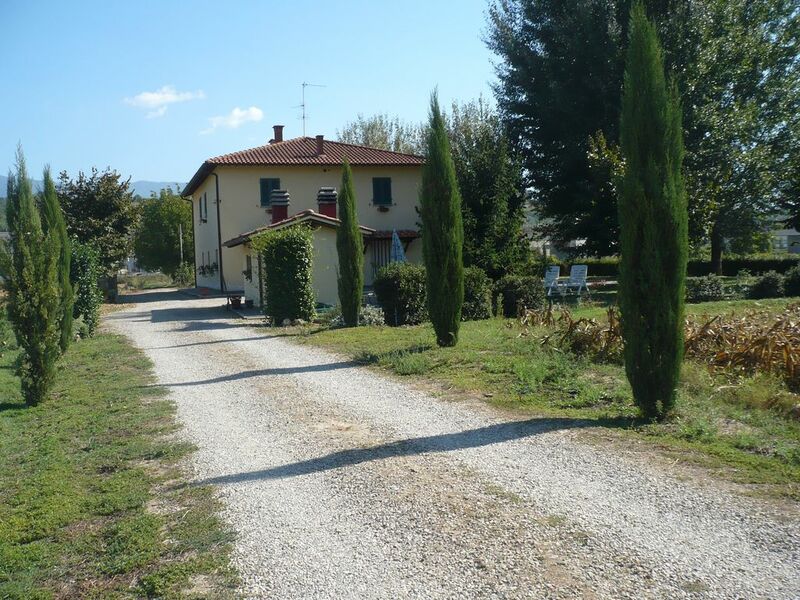 Agriturismo La Ripa, near Florence (15 minutes) and Arezzo (30 min.) And Siena (60 min. ), San Giminiano (40 minutes) is the ideal place for a relaxing holiday in the beautiful Tuscany, in the Valdarno area. Florence (min.15), Siena and Arezzo near. San Gimignano, (40 minutes). The La Ripa farmhouse is located on the plain that extends from the Arno river, just 1 km from the village of Incisa Val d'Arno .. Perfect for relaxing walks or comfortable cycling. easily accessible. Incisa Valdarno boasts the childhood home of the poet Francesco Petrarca (Petrarca) of the early Renaissance. In Incisa in Val d'Arno there are supermarkets, pharmacies, banks, post office, restaurants, bars, bakery, car mechanic, train station and bus stop. Shoppers will enjoy the famous The Mall outlet with Prada, Gucci, Armani and Dolce & Gabbana outlets ............... only 3 km from the farm. Sports enthusiasts can choose (10 km) from a swimming pool, tennis courts, horse riding (2 km), mini golf, golf and fishing ponds. BREAKFAST IS INCLUDED. This will not be served daily but you will find everything you need for your stay inside the apartment on your arrival. La Ripa is a very nice place to stay. This was our second visit. We had stayed for a little over 6 weeks in the autumn of 2014, then again this past autumn in 2015 for about nights. We could not find our review from our previous stays, so I write it now. Gino and Antonella are most gracious, most helpful, most kind and understanding hosts. The apartment has a great location, and all amenities we needed. Thank you for your testimony, we always do everything possible to make you find yourself comfortable, we will be happy to accommodate you in other upcoming occasions. Greetings from Gino and Antonella Giannetti. "A wonderful place to stay; very quaite place, clean, nice yard. The host, Gino and Antonnella, they are really a special persons. A place in middle of Toscania, bless land in Italy. For sure will came back". "Cleanliness excellent. Very beautiful surroundings, easy access to railway and motorway transportation systems. Our hosts, Gino and Antonella, are very nice and welcoming people. We had a great time and we will surely come again." Excelente ubicación, a minutos de la autopista y a minutos de la estación del tren! Gino y Antonella muy cordiales y amables y ella muy dispuesta a ayudar y aconsejar los lugares que vale la pena visitar. Het is een fantastisch verblijf, heel groot met buitenhuis. Fantastische omgeving midden in de natuur. Hele lieve gastvrije eigenaren. Wij gaan zeker nog eens. Bedden al opgemaakt en handdoeken aanwezig! We bevinden ons echt in de beschrijving, voor de hitte is het erg belangrijk om de luiken dicht te doen, die schaduw geven aan het appartement en de lucht circuleren en in de heetste uren ook de glazen ramen sluiten, zodat het huis vers blijft. om soms in de tuin te blijven, heb je ook een shirt met lange mouwen nodig. We really find ourselves in the description, for the heat it is very important to close the shutters, which give shade to the apartment and circulate the air and in the hottest hours, also close the glass windows, so the house is kept fresh. to stay in the garden sometimes, you also need a long-sleeved shirt. Exit the A1 motorway at the 'Incisa-Reggello' tollbooth. The apartment is 1 km from there. Train: Incisa Valdarno station (Florence / Arezzo railway line). Also the station is 1 km from the apartment. Regional cuisine: there are many typical restaurants of Tuscan cuisine and Chianti wines. The proximity to Florence involves all the advantages and activities possible in a large city like this.